The European Union spends billions of euros to fund R&D projects. Who benefits from that money? 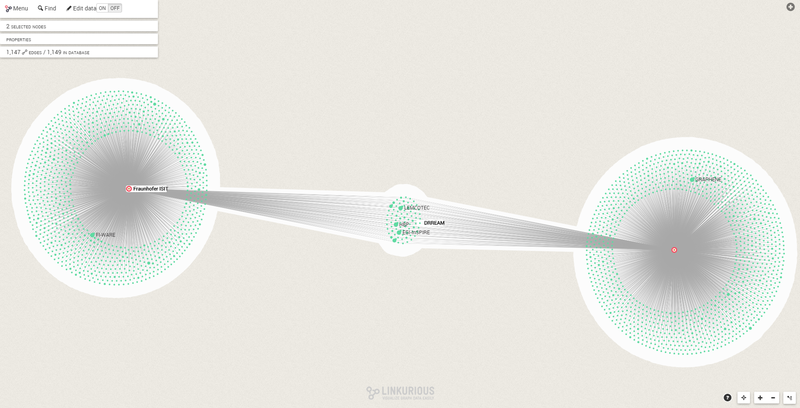 To answer that question, we have worked with Linkurious, a graph visualization startup. Let’s dive into the European research ecosystem! Every year, the European Union invests billions of euros to stimulate R&D across the continent via the Framework Programme for Research and Technological Development. The seventh installment (FP7) ran from 2007 to 2013 and had a budget of just over € 50 billion. The money is spread across 5 sub-programs (http://cordis.europa.eu/fp7/home_en.html). It is spent on grants to research actors to co-finance R&D projects. FP7 is now closed and data about the projects and companies involved in it is available publicly. That data gives a glimpse into the state of R&D cooperation in Europe. We are going to use graph visualization to discover key actors, projects and groups within the European research ecosystem. The best connected organizations active in FP7’s Environment Program. Purple nodes are universities and other higher education institutions; cyan nodes are public research organisations; green nodes are other public bodies; and red nodes are privately owned companies. Projects have a theme and are attached to one program. Multiple organizations collaborate on a given project. Each organization belongs to a country. In our graph we have 33.373 organizations and 26.042 projects representing a budget of 43.747.454.450 €. We have detailed information for each project including its budget, how much it received from the EU, its start date, its end date and its title. Now the data can be searched, explored and visualized through Linkurious, a web-based graph visualization solution by the co-writers of this blog article. The “Enabling Grids for E-sciencE III” project is the biggest project of FP7 with 160 organizations participating in it and a budget of 49M€. Among these organizations, there is for example the CEA, the French Commissariat à l’énergie atomique et aux énergies alternatives. By coloring the organizations according to their country, we can quickly identify that Italian and French organizations are the most involved. 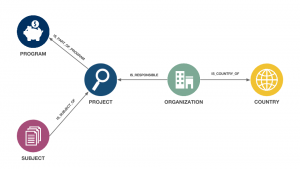 Want to know which organization is involved in the most projects? Easy enough with Cypher. //Which organizations are involved in the most projects? Public research institutions benefited the most from FP7. The French CNRS for example is involved in 1383 different projects. The German Fraunhofer Institute is involved in 1148 projects. Now let’s try to identify the projects that foster collaboration. For that part of the analysis we are going to focus on FP7 Environment, a program addressing global environmental issues like climate change. Let’s start by identifying the organizations that collaborate the most with each other. //Which organizations share the most projects? With that query we can see that the CNRS, the leading French research institution collaborate on 16 projects with the German Max Planck Society. This is a deep relationship between two organizations from France and Germany. The organization which has relationship with the most other organizations is from Italy though. The Italian CNR has ties to 1139 organizations through 65 distinct projects. 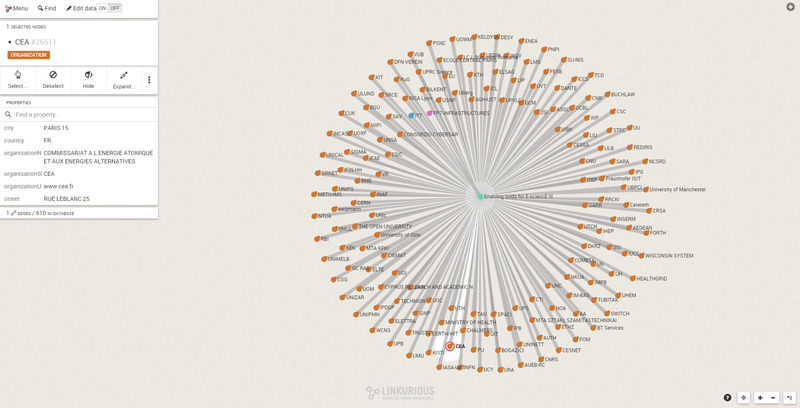 To get a view on the interconnectivity between all organisations who were active in FP7 Environment projects, it is also worthwhile to take an interactive look at (subsets of) the whole network. This will allow us to immediately see which other organisations play important roles next to the Italian CNR. Our data shows that a total of 495 projects were carried out as part of the Environment programme. 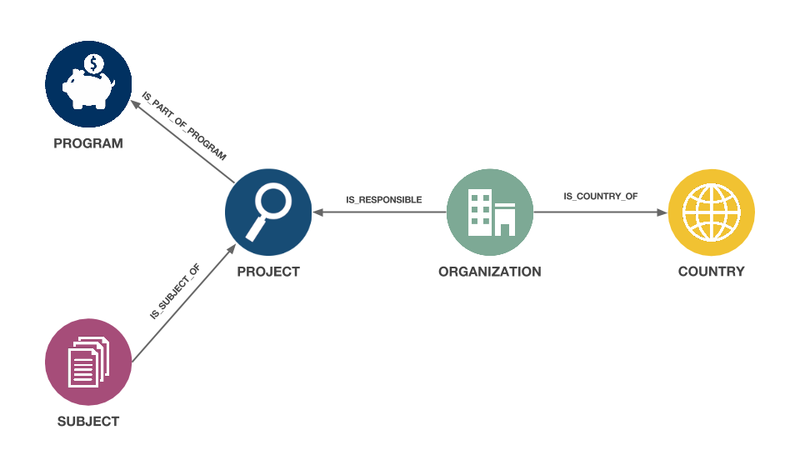 When we assume that organisations are connected to each other when they co-participated in a project, the full network includes 2,974 organizations and 47,360 connections between them. Since the FP7 data sometimes includes multiple ways of referring to the same organization (for instance ‘Centre National de la Recherche Scientifique’ and ‘CNRS’), we cleaned organization names to try and make sure there are no duplicate entities in the network. Let’s first take a look at the most connected organizations in terms of their number of connections. 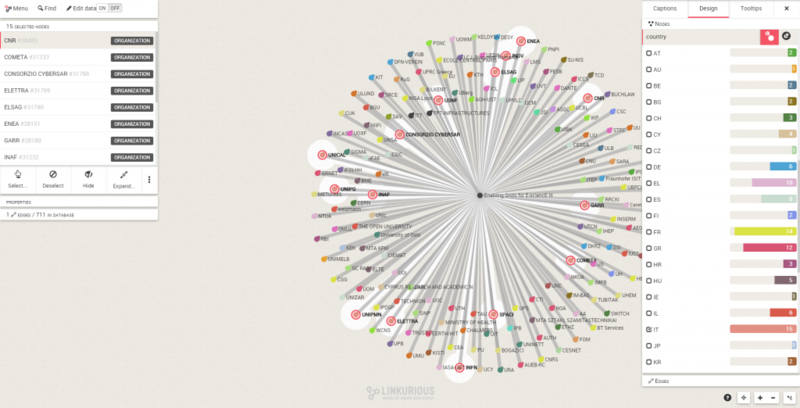 In the visualization at the top of this article, larger nodes have most connections; overall, it shows the 172 organizations with 100 or more connections. Purple nodes are universities and other higher education institutions; cyan nodes are public research organisations; green nodes are other public bodies; and red nodes are privately owned companies. 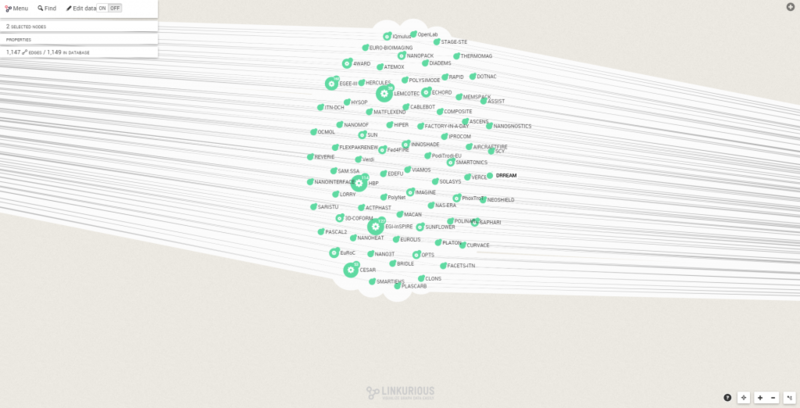 What we are actually seeing here is the very dense core of the network, consisting of all the organizations which have worked with at least 100 or more other organizations from 2007 to 2013. What’s very interesting here is that almost the entire core is dominated by universities (51% of nodes) and research organisations (44% of nodes). The only 3 private companies we see are the French Veolia, the Dutch KWR Water and the Spanish Acciona. The overall interconnectivity here partly relates back to a total of 52 organisations participating in the project ‘Policy-oriented marine Environmental Research in the Southern European Seas’, which received funding of approximately € 13 million. A measure of success for organisations participating in FP7 projects could relate to the number of times they acted as a project coordinator. One interesting question which arises in this context is whether the best connected organisations are then also more inclined to be the coordinator on a project. 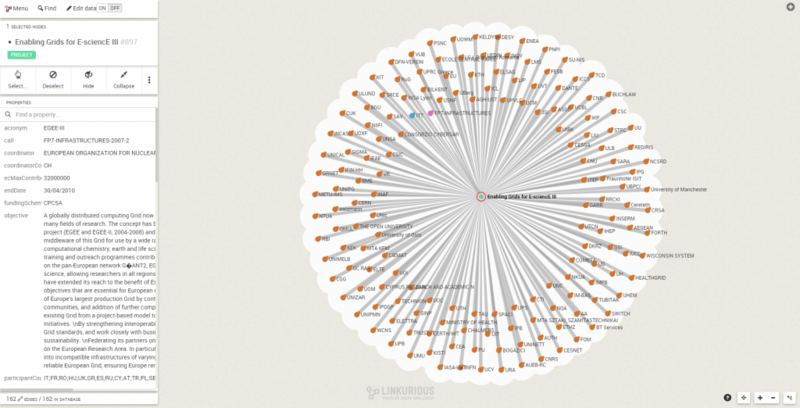 From the visual above, it is pretty easy to distinguish which organisations are leading in terms of connections. Which are leading in terms of attracting project coordinatorship? In the table below, we see that the Dutch Dienst Landbouwkundig Onderzoek (Agricultural Research Service) leads the pack by coordinating a total of 11 projects. Are we able to find all these organisations in the network’s core as well? Using the search function accompanying the visual, we indeed see that nine out of ten appear in the core as well. Just the Barcelona-based CREAL is missing, and occupies a position elsewhere in the network. We see the three companies mentioned above appearing again, this time holding key positions in binding together various smaller clusters of companies. For example, Veolia connects a wide variety of SMEs and larger companies alike in the central cluster through its participation in various projects. Around the main cluster, we see various other groups of companies – the cluster at the top right includes Hewlett Packard and Procter & Gamble. The FP7 funds are reserved to projects where multiple organizations collaborate. The result of this policy is clear. 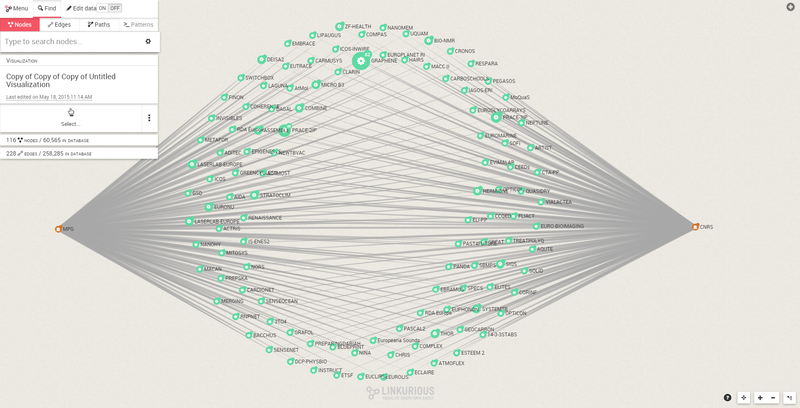 With graph analysis, we have seen that the European Union was successful in creating a large network. National research institutions and large companies collaborate between each other on R&D on a large scale. Exploring the data, we can see key actors, research clusters and emerging trends. Interestingly, research institutes and universities take up the core of FP7 Environment’s collaboration network. Might this be related to the topic at hand, or is this the case in all FP7 projects? Further analyzing the same dataset might provide an answer to this. Visualizing the relationships between organizations based on their project collaborations allows companies, research institutes and universities alike to locate potential partners quicker and get a better overview of activity in their fields. Horizon 2020 (the follow-up program to FP7) is well on its way now – as soon as more data is available, we’ll make sure to provide you with a similar analysis again.